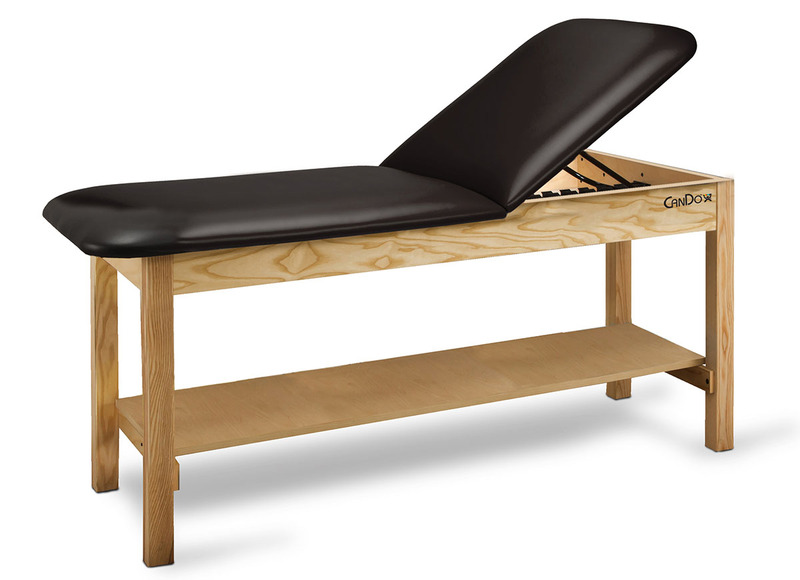 One common tool that Physical Therapists use is a treatment table. For this, we now offer our line of CanDo® treatment tables! This product line includes a variety of different treatment table options to suit the needs of both doctors and patients. CanDo® treatment tables are designed and tested to offer work surfaces that are durable, rigid and comfortable. These fixed height treatment tables come in flat top and adjustable back options. Each table is constructed of very sturdy hardwood with a scratch resistant topcoat finish. This means that they can endure a lot more use than other treatment tables. This makes these tables perfect for the clinic environment. Within our selection of treatment tables, there are varying lengths and widths to choose from. Our longest table is 72 inches long and our widest is 30 inches wide. With a wide variety of sizes, physical therapists can find the perfect sized table to suit their clinics’ needs. Select tables are also available with shelves for storage underneath the table. Instead of storing commonly used products in a shelf somewhere else, this shelf offers just what a physical therapist needs right under the patient. For a sturdy, well-built and accommodating treatment table, we recommend our selection of CanDo® Treatment Tables. Celebrate National Physical Therapists’ Month with a brand-new treatment table. To check out our selection of CanDo® treatment tables, click here.